While in a private car on my way from Kumasi to Accra on Tuesday, 27 March 2019, and at around 18:00 hours (6pm), I could hear a radio presenter play a recorded explanatory message by the Ghana Parliamentary Majority Leader, Osei Kyei-Mensah (Hon). His explanation was in defense of his parliamentary colleague who had come under fury and condemnation of Ghanaians for suggesting to, and encouraging, his fellow parliamentarians to stand up on their feet to observe a minute silence in honour of the seemingly xenophobic massacre of an overwhelming number of people in a mosque in New Zealand. Ghanaians were questioning the soundness of mind, and the nationalism or patriotism of the parliamentarian if he could suggest to his fellow parliamentarians to rise to their feet to observe a minute silence for the fatally wounded New Zealanders while ignoring any such recognition for sixty Ghanaians that had died in a gory lorry accident near Kintampo and twenty or thirty others dead the same day in a lorry accident in the Eastern region. Does charity not begin at home? Does the bible not say, he who claims to love God that he does not see but hates his brother/sister/neighbour that he sees is a liar? The just cited sayings are to prove the hypocritical nature and/or the senselessness of the actions by some of, if not all of, our Ghana parliamentarians. Your very backyard is in conflagration, and like an ostrich, you cannot see it but to bury your head in the sand. They could feel the pain for the dead in New Zealand either because they are Whites, Muslims or are superior to us as black people or Ghanaians, but not for our very Ghanaian compatriots that had been burnt to death beyond post-mortem recognition. 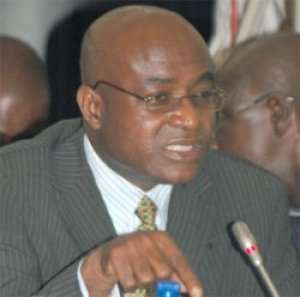 I have nothing against that Member of Parliament who without giving his suggestion much thought requested for the observance of a minute silence for the New Zealanders but I am angry at the defence explanation by Osei Kyei-Mensah (Hon), the NPP Majority Leader in Parliament. His explanation was completely absurd and unbefitting of a Member of Parliament let alone, the Majority Leader. According to the news broadcast, he said, no minute silence was made in honour of the Ghanaian dead, because Parliament had not yet received any report on the dead. Had not the news outlets in the nation repeatedly announced the accidents on air and in their newsprint? Who was Osei Kyei-Mensah (Hon) waiting on to officially receive the report on the gory accident and the dead from before requesting parliament to rise to their feet at their parliamentary session to observe a minute silence for? I personally find his offered reason preposterous. He could have calmed the tempers of the furious Ghanaians by putting up his hands to tell the nation that to err is human and that his colleague and the entire parliamentarians have made a great mistake by what they did at the expense of the Ghanaian dead in the two fatal accidents. This could have earned him more respect than his senseless explanation of waiting for a report from whomever first, before parliament did what was honourably expected of them. By the way, did they receive any report from New Zealand and if so, from who, before they observed a minute silence for the massacred religious worshippers? To conclude, let Osei Kyei-Mensah (Hon) and his colleague Ghana parliamentarians understand that there are intelligent Ghanaians out there monitoring and assessing their conduct. How I hope he will come out to apologise to the nation for underrating our intelligence if not taxing our patience, by his rushed provocative defensive explanation. It takes a gentleman to put up his hands to say sorry, when he makes a mistake. This is an advice I leave for Osei Kyei-Mensah (Hon) and his colleague parliamentarians. In some civilized advanced nations, a national day of mourning could be declared for such a great number of people dying under such sorrowful conditions as happened in the two road accidents on same day in both Eastern and Brong-Ahafo regions.